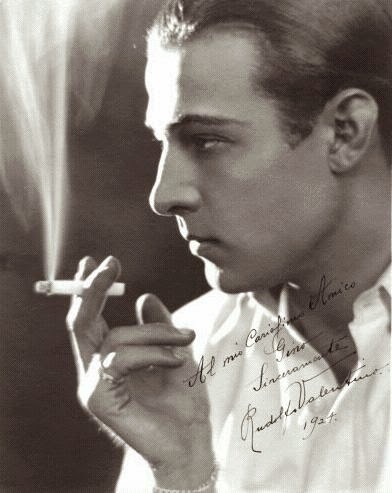 I have been a fan of Rudolf Valentino as far back as I can remember. Being inspired by one of my favorite reads, Retro Rover, today's post is all about Rudi and his dogs. I won't go into Valentino's personal life. There was a enough drama there to keep him on the covers of our modern tabloids every week. After all, he was the first superstar of the cinema. His persona invented screaming females. I will include a link below, for more reading. And his life is interesting reading. 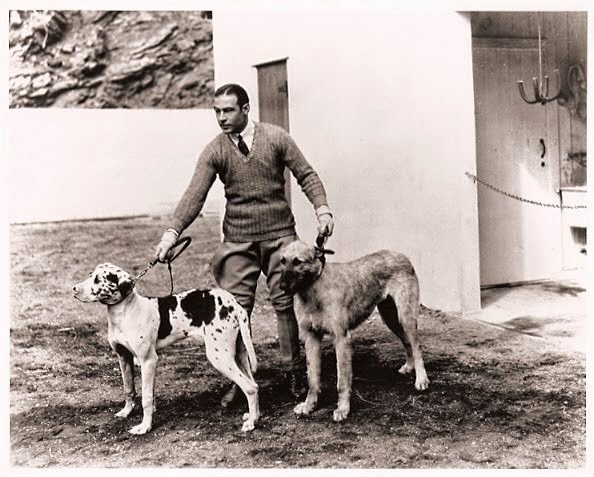 Rudolf Valentino was not a Poodle man, so you won't find Poodles. 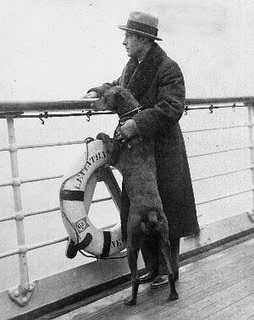 But, dogs were a big part of Valentino's life and Kabar, a Doberman Pincher, was the most important. Kabar, on the Leviathan with Valentino. In those days, dogs traveled first class with their owners. Kabar was born on June 20th, 1922 in the Alsace region of France. It is said that he was given to Valentino by a Belgium diplomat who was a fan. Kabar was pretty much by his side until Valentino's untimely death in 1926. 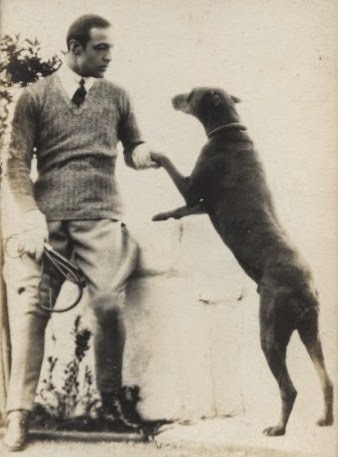 Although Kabar was by far the favorite, he was not the only dog Rudolf Valentino owned. He kept a few dogs at his home Falcon Lair. This is a picture with a couple outside his horse stable. Rudi was an avid horseman and would perform his own stunts in movies. For some reason, Valentino did not take Kabar with him on his last trip to New York, where he died on August 23rd, 1926 at 12:10 P.M. He was only 31 years old. The legend goes that, although, Kabar was completely across the continental US, he started howling the minute Valentino died. After that, Kabar was continually sick and on January 17th, 1929 passed away. 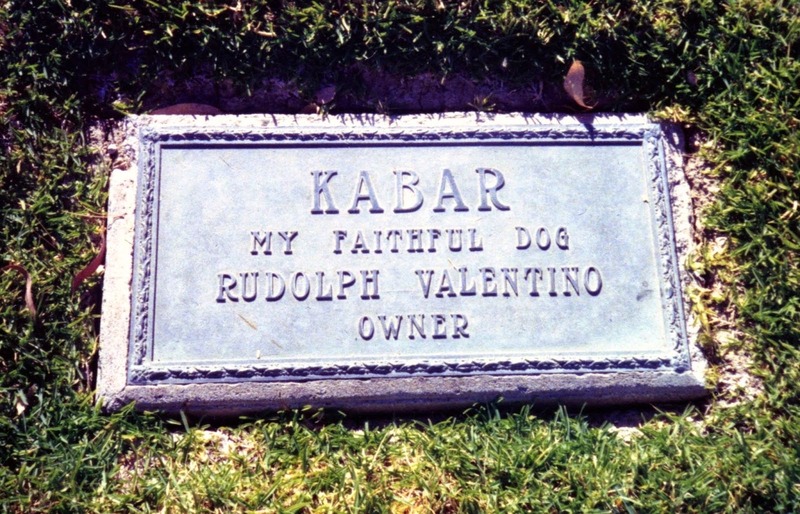 Alberto Valentino (Rudi's brother) had Kabar buried at the newly founded L.A Pet cemetery. So this wraps up my story of not just another man and his dog. In closing, I have to add a picture of the role that made Valentino the object of adoring fans. It also broke the stereotypical roles he had been given of the heavy bad guy. 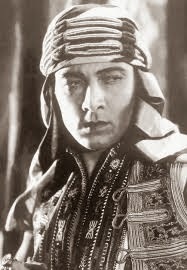 Rudolf Valentino, as The Sheik. This is the link to my favorite web site on Valentino. Donna Hill has an amazing amount of pictures and facts HERE. O.K, now this is the end.